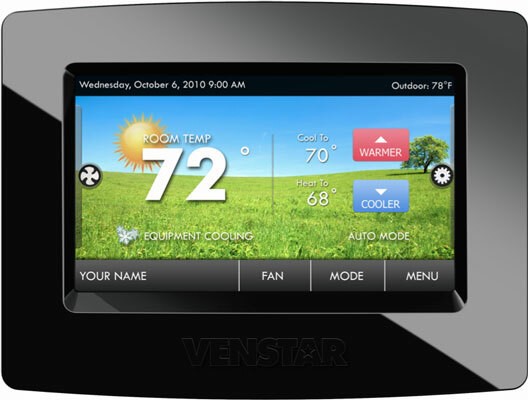 Venstar offers the ColorTouch smart thermostat to help with your home automation. Venstar’s ColorTouch is a nice addition to the home automation product market, but if you want to get your hands on one, you’ll have to find a Venstar dealer on its website. Click or tap the Distributors tab to find one near you. Credit: Image courtesy of Venstar Incorporated. A nice touchscreen interface makes it simple to use and to find what you’re looking for in the menus. You can upload items such as personal pictures to use as wallpaper on your ColorTouch touchscreen. Holiday and nature themes are already loaded into the ColorTouch, but you can customize if you like. Who doesn’t want to put a picture of her granddaughter on the front of her thermostat? ColorTouch is compatible with the vast majority of systems and wiring conditions, but you need to contact a local Venstar distributor to find out whether ColorTouch will work for yours. ColorTouch can speak your language, assuming it’s English, Spanish, or French. You can prevent anyone from “accidentally” changing your thermostat’s settings by using a super-secret passcode that Bond himself couldn’t break. ColorTouch uses SkyPort technology to allow it to communicate with your Wi-Fi and therefore your smart devices. You can control your ColorTouch on the road as well as at home using the Venstar SkyPort app.